British tanks deploying for World of Tanks. Britain! Right-o! he Brits have always been sorely missed in World of Tanks. They played fairly crucial roles in both World Wars, invented the blasted things, and then came up with the utterly badass Centurion – one of which survived a nuclear test blast and went on for another 23 years of service. Fortunately, that imbalance has been redressed with the announcement of the British tank tree for World of Tanks. 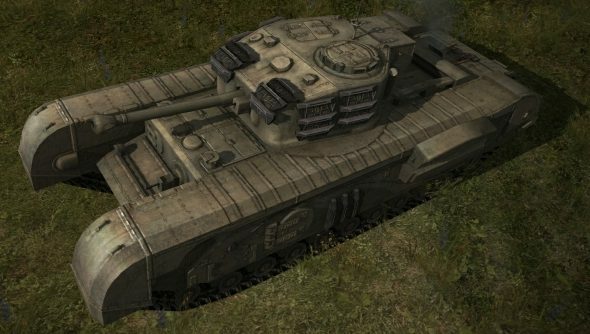 Joining the American, French, German and former Soviet Union trees will be some 20 different British tanks. These are divided into two main categories: fast and powerful, and heavily armoured, which roughly puts them on par with current medium and heavy tanks. There don’t seem to be any light tanks in the British tree, which suggests they’ll be available to high-level players only. There’s no word on how long we’ll have to wait until the Brits take to World of Tanks’ weirdly sparse levels, but the trailer above should keep tanky appetites thoroughly whetted for a good week or so.